Mac users have always touted the Mac OS as one of the main reasons they use an Apple computer. There have always been and remain other reasons, such as elegant design, build quality, and even price-performance ratio, but it's the Mac OS that really makes a Mac a Mac. Since 2006, the OS has become even more prominent as a reason to use an Apple, as modern Macs use the exact same Intel processors as many generic PCs, and Intel Macs can even be used to run Windows (very well), natively and in emulation. If it is the OS that makes Mac users choose Apple computers, shouldn't that same OS X, in a more compact version, make Mac users choose the iPhone instead of other smartphone models and systems? The iPhone even shares some of the Mac applications you already know and love (Safari and Mail) in very near to full-featured versions. Things promise to get even better with announced enterprise support including Microsoft ActiveSync to enable iPhone users to synchronize with a Microsoft Exchange server. Why would any Mac user choose anything else? Why do I have a BlackBerry 8800 clipped to my belt instead of Cupertino's finest? There are some reasons that everyone has read about, chief among them iPhone's exclusive tie-in the AT&T, but even taking the carrier out of the equation, there actually are uses for which a more conventional smartphone is a better choice. While a combination of my satisfaction with T-Mobile's service and aversion to a new contract played heavily in my decision to buy another BlackBerry (my third in four years) instead of moving to an iPhone, there are other equally significant reasons. Read on. First, as an attorney practicing in a wide variety of state, federal, and administrative courts, as well as government offices located in secure federal buildings, there are many times when I cannot bring any phone at all with me. Clearly in those cases, it doesn't matter what system I use, as it stays in the car. Where it does matter is in cases where phones are allowed, but cameras are not. Many government agencies and corporations have similar no-camera restrictions on their facilities, and Apple does not make a camera-free iPhone. RIM always has at least one non-camera BlackBerry, as does Palm with its Treo, precisely for this reason. I had to pay extra and move up to the top model to eschew the camera, pushing my BlackBerry right into iPhone price territory. Palm, Windows Mobile, Symbian, and BlackBerry all synchronize with Microsoft Outlook on a PC, as does the iPhone, but for Mac users, iPhone and BlackBerry are the only options unless you buy a third-party application such as Missing Sync or PocketMac. BlackBerry requires these programs as well, but RIM has adopted the license for PocketMac, so Mac-using BlackBerry owners can install and use the program for free. Synchronization on a Mac is where there are tradeoffs. With an iPhone, Entourage or Address Book and iCal data can be synchronized easily. With a BlackBerry and PocketMac, iCal and Address Book are fully supported, but the current 2008 version of Entourage is not yet enabled. Clearly, if you use Entourage 2008 (as I do), the iPhone is much easier. If you use Exchange, however, it works right now on a BlackBerry, but you need to wait a few months for it to be enabled on the iPhone, and we don't know yet if the ActiveSync software will be cross-platform or Windows-only. There is a workaround for BlackBerry users and Entourage 2008, and that is to configure Entourage to synchronize with iCal and Address Book, then everything will work using PocketMac. PocketMac is set to release an Entourage 2008 compatible version about the same time that Apple plans to update its iPhone software. The iPhone is justly praised for its superior random-access voicemail function, and for heavy voicemail users it's a major advance. The iPhone also has the best web browser in the smartphone market and arguably the best email application. 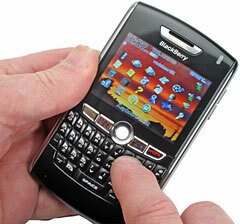 Arguable, because usable mobile email was introduced on the BlackBerry and has been improved with each new version. A modern BlackBerry, just like the iPhone, supports multiple email accounts and can have custom settings for each of them. You can view a unified inbox, separate account inboxes, or both, and you can view almost any attachment with ease. It really doesn't have any feature that the iPhone's Mail.app doesn't, but in the small-screen format I just find it easier to use. Of course, I've been using BlackBerry mail for four years, and that very likely plays a large role in my preference. Now, for my biggest reason for buying the BlackBerry: batteries. The iPhone battery is enclosed and requires disassembly to replace. The BlackBerry battery, which lasts about the same amount of time as the iPhone's, can be easily replaced with a fresh one in a matter of seconds. I keep a spare battery in my briefcase and have used it quite a few times on long travel days. Yes, you could carry a charger, but a spare battery is much smaller and lighter, and there are times and places that you just can't get power. Its safe to say that most Mac users will find smartphone bliss with the iPhone and deal with frustration when trying to use anything else, including a BlackBerry. Like adapting a Mac to a Windows environment, however, a BlackBerry can be adapted to a Mac - and it works quite well once in use.